“How should we proceed?” Avingard asked. With that, the legionnaires readied their weapons and began charging through the snow towards Korvanjund, which was down below in a small valley. While the seasoned soldiers rushed through the deep snow, Avingard found it difficult since he wasn’t used to both the deep snow and the heavy armor. Nonetheless, Avingard pushed on and kept up with his fellow soldiers the best he could. As the group of legionnaire approached Korvanjund, Avingard could make out several Stormcloak soldiers guarding the entrance to the large temple. As the Legionnaires came closer, the Stormcloak soldiers readied their weapons and charged to meet the challenge head-on. 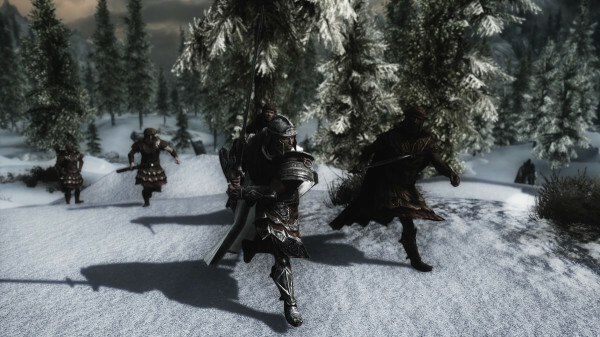 Not breaking stride, the legionnaires engaged in battle with the Stormcloaks. The number of soldiers was about equal on both sides, with the Stormcloaks having several archers raining arrows down on the legion soldiers to the legion’s lone archer. Avingard and the Imperial Legion charging Korvanjund. Avingard joined the battle, a little behind his comrades, but still managed to deal some damage to the Stormcloaks. Raising his large sword, Avingard attempted to slash the Stormcloak, only to be rebuffed by the heavy shield of the Stormcloak. This caused Avingard to be thrown back and almost lose his balance. Seeing the opportunity, the Stormcloak lunged at Avingard, barely missing him. Gaining his footing and balance, Avingard countered with a thrust of his own into the side of the Stormcloak. Realing from the attack, the Stormcloak fell back against a wall and lowered his sword and shield. Seeing a huge opportunity, Avingard thrusted his sword into the gut of the Stormcloak, until the soldier fell lifeless on his blade. At this point an arrow grazed Avingard’s head, striking the stone wall behind him. Looking in the direction of from where the arrow was shot, Avingard spotted a Stormcloak archer perched near the entrance the temple. The archer took aim a second time at Avingard, but the archer failed to notice a Legion soldier charging at him with his sword at the ready. At the last second the archer spotted the soldier charging him, but by the time he could get ready, the legionnaire slashed his sword killing the archer. The legionnaires opened the large doors to the Korvanjund temple as quietly as they could to avoid alerting any Stormcloaks soldiers that may be just on the other side of the doors. Slowly entering the temple, Legate Rikke looked around the entrance, and after not seeing a Stormcloak immediately, she signaled for her troops to enter. They closed the door behind them as the last one entered. Just inside the entrance to the temple there was a small wall that all the legionnaires ducked behind. Legate Rikke rose enough to see over the small wall and scope out the situation. 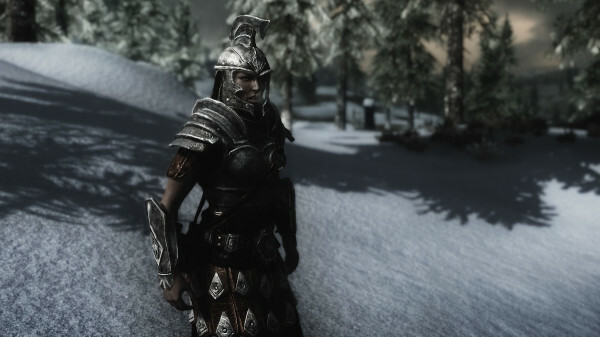 She spotted a few Stormcloak soldiers, not enough to present any serious challenge to her or the legionnaires. With that, the legionnaires charged forward towards the Stormcloak soldiers. Within seconds the few Stormcloaks that were near the entrance were lying dead. The Legion soldiers had rushed too quickly for the Stormcloaks to react. The legionnaires, minus the two left to guard the entrance, moved further into Korvunjund. As they advanced forward they noticed to passageways ahead. One, on the right, was blocked with large boulders, but the left passage was clear. The group moved through the left passage, being ever wary of an ambush. As they emerged from the passage, one of the legionnaires spotted three Stormcloak soldiers on a ledge above them. Noticing steps going up to the ledge, Avingard and another legionnaire charged up the steps. The three Stormcloaks readied their weapons and charged at the two legionnaires. Avingard swung his sword at the first, knocking the Stormcloak back into a second Stormcloak. With the two Stormcloak soldiers off balance, Avingard managed to thrust the blade of his sword into the shoulder of the first Stormcloak. The soldier fell dead on top of the second, who struggled to get free. Just as the soldier managed to get out from under the dead soldier, his neck was met with Avingards sword, killing him instantly. The third soldier, meanwhile, was busy with the other legionnaire that joined Avingard on the ledge. The Stormcloak thrust his sword at the legionnaire, grazing his side, that caused the legionnaire to quickly dodge and grab his injured side. Thinking he had an opportunity to finish off a Legion soldier, the Stormcloak lunged a second time, only to have his attacked parried by the legionnaire. As quickly as he parried, the Legion soldier brought his sword around and struck the Stormcloak in the side, first stabbing him with the blade, and then thrusting it deeper into the Stormcloak’s body. The Stormcloak, attempted to free himself from the blade, but eventually breathed his last breath and fell to the ground. With the three Stormcloaks lying dead, Avingard and the legionnaire returned to the group of legionnaires. By this time, the Legion soldiers, with Legate Rikke in the lead, ad moved to the north end of the room. The a portion of middle of the room was inaccessible because of a large cave-in. “But there isn’t any other way through, Legate,” a soldier explained. Avingard wasn’t keen on the plan – finding a way and then engaging in a fight with an unknown number of Stormcloaks alone. Unfortunately, refusing Legate Rikke’s orders would be considered insubordination, and his dismissal from the Legion, so he nodded his agreement and left the group to find another way around the passage.